At 2:00pm today in room 115 at the Statehouse, the House Federalism Committee will hold “interested party” hearings on H.B. 201, Constitutional Carry! UPDATE: The Committee Hearing Time has been changed to 2:00pm! I hope you had a chance to contact the members of the House Federalism Committee already. But even if you have, I hope you’ll take a moment RIGHT NOW to do it again! I’ve listed their phone and email information below to make it as easy as possible for you to jump in on this fight! As you know, Constitutional Carry is sweeping the country and it’s the simple idea that if you’re legal to own a firearm you’re legal to carry it. What’s more, the legislature is getting ready to go on summer break, and we need to get H.B. 201 out of committee before they leave Columbus! That’s why I hope you’ll take a moment right now to call, email or Facebook message every single legislator listed below! So please go through and, at a minimum, email every single legislator on this committee. But if you can, I hope you’ll also take a moment to call and send them a message on Facebook, too! The actions of gun owners like you are what forced the Missouri and Idaho legislatures just last year to pass this same legislation into law in those states. The same action by gun owners this year in New Hampshire and North Dakota had the same results. And with your help, I’m confident we can do the same thing here in Ohio! So please call, email and send a Facebook message to the members of the House Federalism Committee right away and tell them to PASS H.B. 201 out of Committee and send it to the floor of the House for a full vote today! 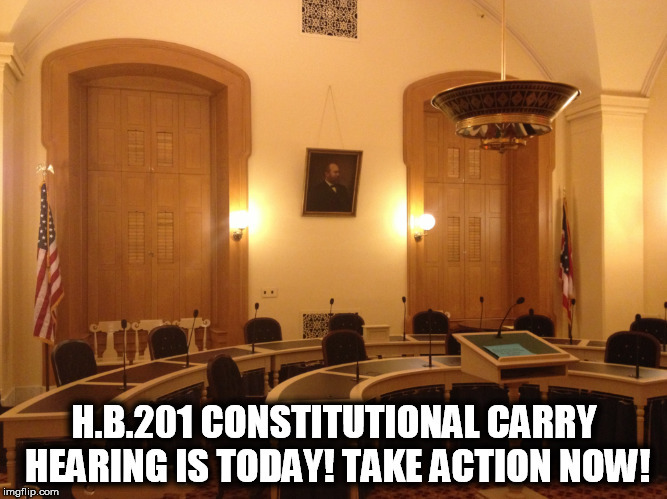 Today is a big day for gun rights in Ohio. It is ONLY because of your dedication and action that we’ve pushed Constitutional Carry this far already. But we can’t let up now. P.S. Today at 2:00pm in room 115 at the Statehouse is the 3rd hearing on H.B. 201, Constitutional Carry! Once you let the Government in you HOME it is just a start to TOTAL GUN CONFIATION , We can not let them in are homes for any reason unless we ask them to come in.